As Americans get savvier about environmental consequences, why aren’t they embracing natural burial? There was a naked body wrapped in yards and yards of unbleached muslin perched over an open grave, and Mary Woodsen was speeding to get there. An early spring snowfall had dumped 2 feet of wet snow on Irish Hill making the going tough, but as founder of the cemetery Mary had been there many times before. The car swerved all over the road. She knew it was a fine line between spinning out and reaching the summit. Tiffani Jones (name changed) was being buried today. A 43-year-old woman with brain, kidney, liver and spinal cancer. Her body finally gave out, and her mother wanted her buried up on the hill. Mary was glad Tiffani was local — from the hardscrabble village at the base of the hill — because after five years, she was a little tired of Greensprings being seen as a groovy, hippie alternative to traditional burial. From all accounts Tiffani was a hard-drinking, hard-partying woman and many of her mourners were cut from that same cloth. They stood shivering in thin leather jackets pulled tight around their bodies while the wind blew, making it seem colder than 28 degrees. The other day I went to Greensprings natural cemetary and nature preserve and witnessed a green burial. 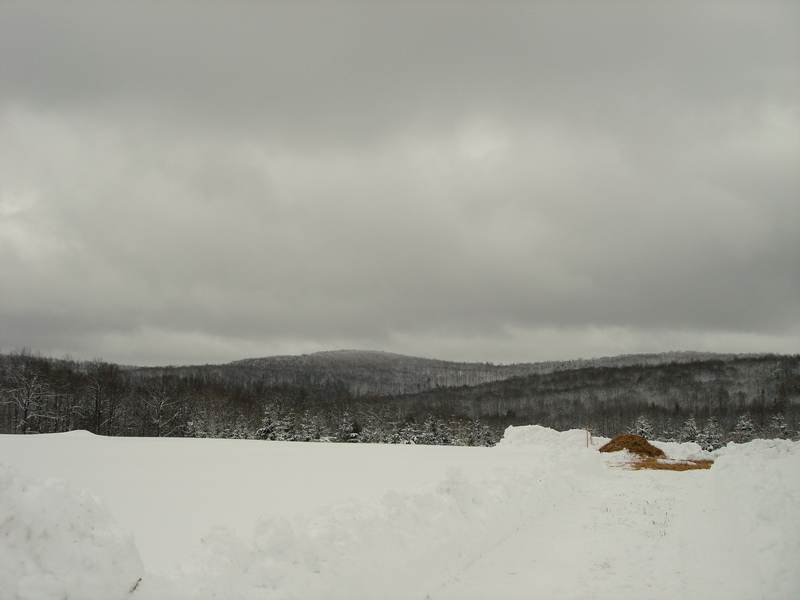 Although it was the beginning of March the snow was about thigh deep up on top of the hill outside Newfield, New York. Greensprings owns about a hundred acres and since opening a couple of years ago, has buried about sixty people. 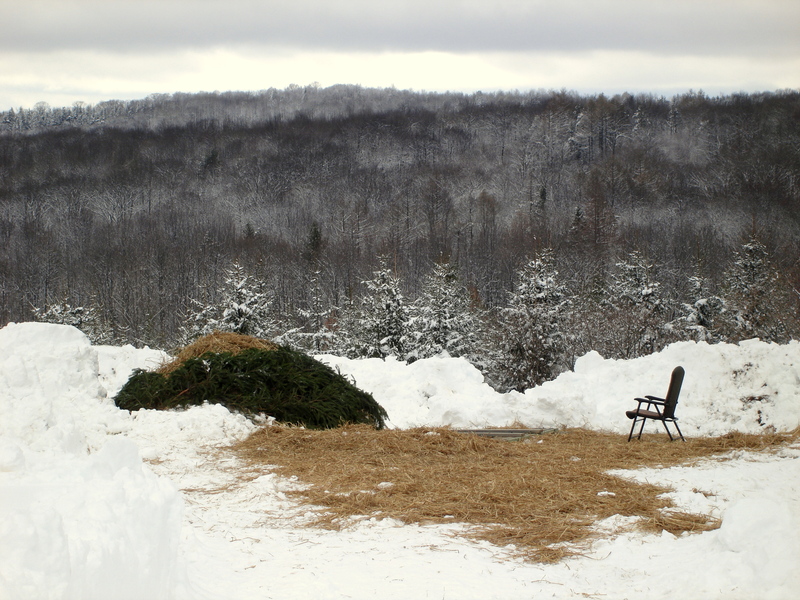 Here’s a view of the open grave on the crest of the hill. 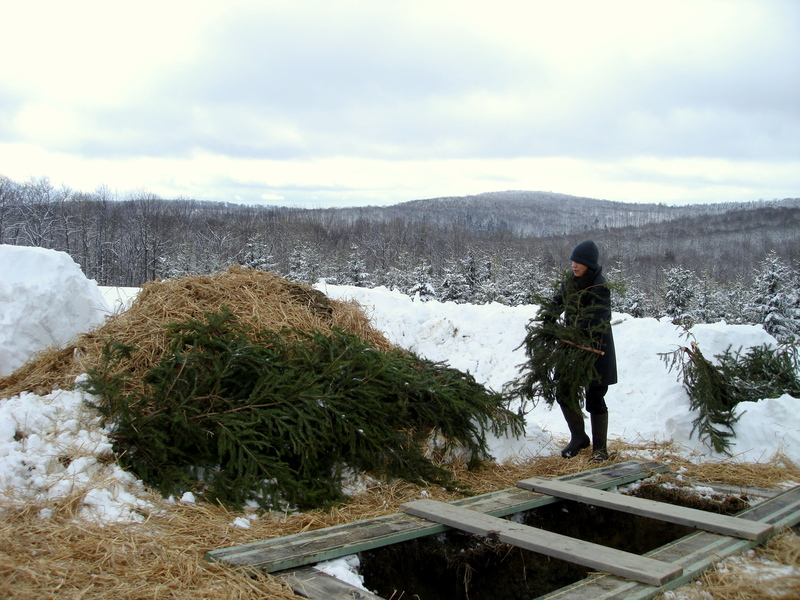 Mary Woodsen, Greensprings trustee, cuts and brings Norway spruce boughs to cover the dirt pile. Later, the family will place these boughs in the grave on top of the body. A chair for the mother of the deceased young woman is placed near the open grave.